A stunning micropave ring with 2 rows of brilliant micropave to accent the center (.25ctw natural diamonds in G-H color, SI2-SI2 clarity). Please note the set photo shows both the ring and matching band. The band is available to order here. This is for the ring and prongs (termed a 'semi-mount ring'). For a completed, ready to wear/gift ring, please add a loose center stone of your choice to your cart before checking out. We will automatically assemble the ring and center stone for you at no charge so that you will receive a completed, ready to wear/gift ring. Alternatively, if you are buying the ring to have a local jeweler set a diamond or center stone you already own, please indicate the center stone size and cut in the ordering instructions box shown during the checkout process, so we can put the appropriate prongs in for you. Please note - unfortunately, the minimum ring size we can make this ring in is size 5, and the maximum is 7.5. We cannot make or resize this ring smaller than a size 5 or larger than a 7.5. This ring is only available in 14kt white gold. 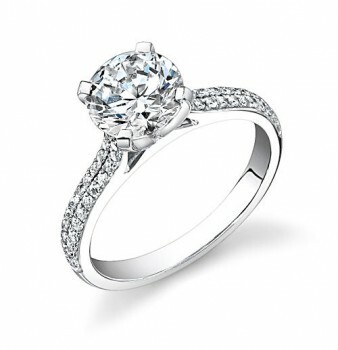 The largest center stone size this ring can accommodate is 9mm. Height with stone: Sits 9mm off of finger (6.5mm Princess stone). We ordered the 1.5 Asha princess cut diamond and I have to say it is the most beautiful ring ever. I am in Love with it. It sparkles and shines and I've gotten so many compliments on it. I can't wait to wear the band to complete the set. We have to say we are very pleased with our decision after searching for the perfect diamond this is the way to go! And your able to save yourself a good penny and you'll be more than pleased! We ordered this ring with the 2.5 carat Flanders cut, "points out" style. I was worried the band would take away from the center stone, and man, was I wrong! It's just the perfect amount of "bling" to compliment the center stone without overwhelming - just takes it up a notch from a plain solitaire band. The small diamonds are quality and compliment the stone perfectly! If you like a lot of little "starry sparkles" to compliment your stone, this is the ring for you! We ordered the micropave setting with a 7.5 mm cushion cut asha diamond and it literally is the most beautiful ring i have ever seen! it's just gorgeous and we are just so pleased with it. excellent customer service too!! I received the ring a week ago and proposed to my girlfriend and she loved it and can't stop staring at it. Everyone comments on how beautiful and stunning it is so thankyou very much for making our lives very happy. After the longest 10 days of my life and constantly checking the UPS app on my phone I got my ring. It is amazing. It blows all of the other engagement rings I've seen lately out of the water ten-fold. If you are not sure or hesitant to get an ASHA.. go for it! 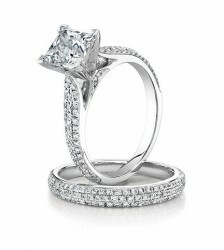 During my quest to find the perfect ring I saw many diamonds and could not justify spending that much money on a ring. My fiancé was hesitant to buy me anything other than a diamond but I was able to convince him it was the smartest thing to do. After he saw the ring he was happy we did too. I got the 7.5mm cushion H color. It's amazing and looks so real. I am really glad I went with the H color because it has that slight tinge of warmth that gives it such a realistic look..with the cushion in there it's a match made in Heaven.